Views of fall foliage and Mount Greylock. It was one of those perfect New England Moments that no photo can adequately capture: a swirl of butterflies flitting above a patchwork of late-summer wildflowers and ochre leaves, bathed in autumn’s golden light. Just ahead of us was a mountain summit, with the promise of color-drenched views of four states and the sweet reward of a Honey Crisp apple. Hiking heaven. Such are the delights of the Berkshires in autumn. While this region is a cherished cultural zone, we love its sporty side, especially the hiking. Raging natural beauty abounds on easy trails and tougher treks alike. “Even when we come out here with no intention of hiking, we end up on a trail. 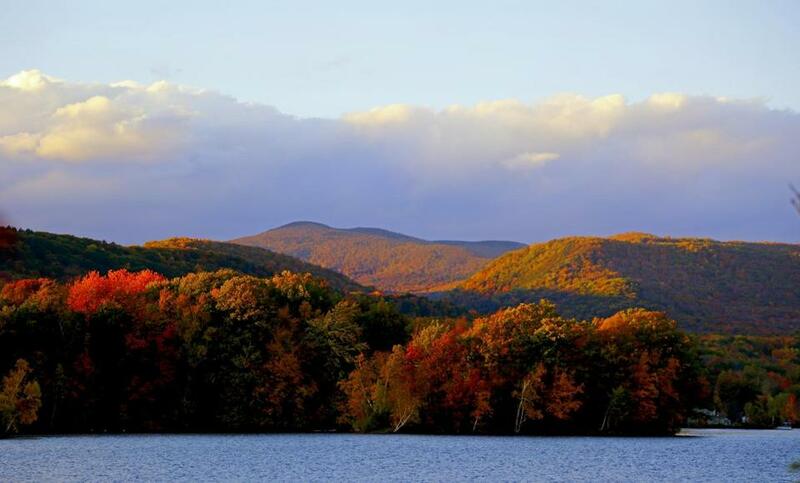 The hiking [in the Berkshires] is just too good to resist,” says Paul Kelley of Marstons Mills. (Tip: Stash a pair of boots in the car before any road trip, in case the mood hits.) Here are four favorites that are fabulous in fall. Massachusetts has its own Mount Washington, dontcha know: Mount Washington State Forest, located in the southwest corner of the state near the borders of Connecticut and New York. The forest spans more than 4,000 acres, and is laced with 30 miles of trails, but it is fairly undiscovered. (Most visitors head directly to Bash Bish Falls, adjacent to the forest, a dramatic 60-foot cascade with rock pools and a nearby parking lot.) But if you’re up for a true hike, Alander Mountain is a worthy option. The blue-blazed Alander Mountain Trail traverses open meadows and shady woodlands of sugar maple, gray birches, towering hemlock, red maple, and quaking aspen, making this an awesome hike even before you reach the 2,239-foot summit of Alander. Count on plenty of ups-and-downs as you conquer the 840-foot vertical rise, but there are no super-long stretches of straight-up incline. The views are straight-up fabulous, extending in every direction, including Mount Greylock to the north, Mount Everett to the east, the Catskills to the west, and the Adirondacks to the far northwest. Settle onto on a sun-warmed slab of granite and dig into the lovely picnic you brought along (those bagel sammies from Great Barrington Bagel travel well, and we can personally vouch for the ganache-topped brownies from Chocolate Springs Café). Life doesn’t get much better than this. Allow yourself about three hours for the hike, plus extra time at the summit. For a downloadable trail map and directions, visit www.mass.gov. Up for an easygoing ramble? Trails lined with tulip trees and quaking aspen lead to one of the state’s most unique places, Bartholomew’s Cobble. The history of these twin, rocky knolls traces back 500 million years, when the area was an inland sea and the cobbles were composed up of coral reefs, shells, and sand. Now, the hundred-foot-high bedrock outcropping (mostly quartzite and marble) supports 800 species of plants, including a crazy number of fern species. More than 230 species of birds have been recorded here; fall (mid-September through October) is the peak time to see migrating hawks. No wonder Bartholomew’s Cobble has been designated as one of the state’s National Natural Landmarks. Choose among 5 miles of trails, mostly easy meadow loops, and a climb up Hurlburt’s Hill at 1,034 feet. The 0.8-mile walk up the hill follows an old tractor path into a hardwood forest, winding through a meadow to an open pasture directly on the Massachusetts-Connecticut border. The view from this lofty vantage point is wondrous, a panorama of the Housatonic Valley in its fall finery. Look for the marker that reads CT on one side, MA on the other, so you can straddle two states at the same time. Access Bartholomew’s Cobble via the Trustees’ visitor center in Sheffield. Allow about two hours for this one. www.thetrustees.org. There are three ways to get to the summit of 1,640-foot Squaw Peak (so named because a lovelorn Native American woman hurled herself off the cliff, according to legend). None is more than 3 miles long, but, given the 720-foot elevation gain, you’ll feel like you’ve gotten a cardio workout as you trek up this mountain of pale quartzite. The longest route, 1.5-mile Indian Monument Trail, follows an old carriage road along ancient Native American paths and past stone walls of old sheep pastures. Squaw Peak Trail offers a good .7-mile jaunt with excellent views, running alongside steep cliffs in spots. Hickey Trail (.8 miles), the most strenuous, leads directly up the mountain from the parking lot. However you get there, you’ll enjoy the reward: sweeping vistas of the Taconic Range and the Housatonic River Valley, ablaze in autumn’s fiery palette. The trailhead parking area is off Route 7 in Great Barrington. www.thetrustees.org. The highest point in Massachusetts, 3,491-foot Mount Greylock, is the ultimate Berkshires hike, with summit views that span four states and 90 miles. (There’s a road to the summit as well, open seasonally.) This 12,500-acre state reservation offers 70 miles of trails ranging from easy to aggressive. For fit, experienced hikers looking for adventure, reaching the summit via the Appalachian Trail is an invigorating way to go. The trail travels the spine of the mountain, to the 92-foot-high Veterans War Memorial Tower at its peak. Park at the trailhead at Outlook Avenue in Cheshire (look for the triangular AT signs.) The 6.8 miles to the top — nearly 14 miles round-trip — will take you at least seven hours, so start early, bring lots of water, and make sure you’re physically up for this. (If not, see auto road, above.) As for foliage: You’ll be in the thick of it, hiking through forests of oak and maple, along with thickets of birch, hemlock, and centuries-old spruce. Note that the weather changes as you ascend, so you’ll want to layer your clothing and bring gloves, a warm hat, and waterproof jacket to stay comfortable on your trek. Of course, the views from the summit on a clear day are beyond gorgeous, taking in the peaks of Vermont, New Hampshire, Connecticut, and New York in a kaleidoscope of color. On a cloudy day, you’ll see . . . not so much. But, hey, you made it! To download a trail map, see www.mass.gov.